Grains trading mixed overnight. Beans up 1 ¼ cents, corn unchanged, and wheat down a penny. U.S. stocks tumbled late Monday afternoon after reports surfaced that the U. S. is preparing to announce tariffs on all remaining Chinese imports ($257 billion dollars) on Dec 1, if the talks between President Trump and Premier XI in November fail to make progress to ease the trade war. The Crop Progress report released yesterday showed corn harvest 63% complete, up 14 from last week and equal to the 5-year average pace. Soybean harvest estimated at 72% complete, up 19 from last week, but still below the 5-year average of 81%. Winter Wheat is estimated to be 78% planted, up 6 from last week, but still below the 5-year average of 85%. Kansas is estimated at 76%. November 8 is next WASDE Report. 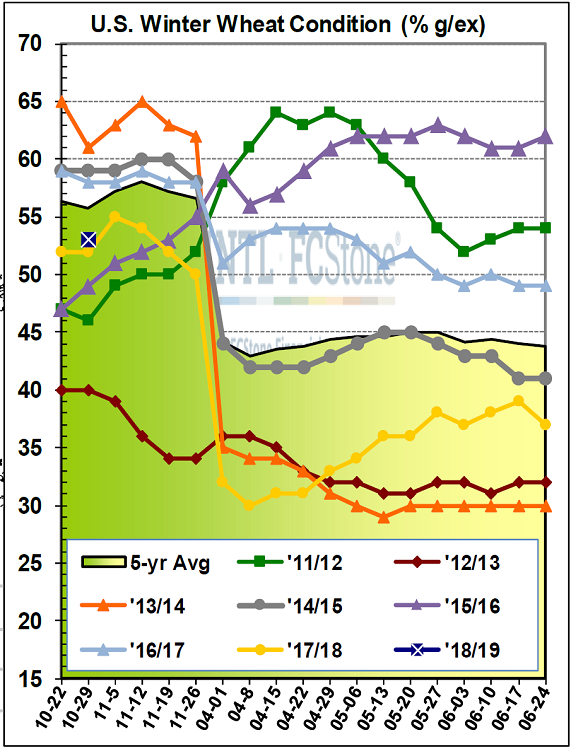 Initial national winter wheat ratings came in at 53% good/ excellent, a point above last year’s comparable week but behind the 55% five-year average number and a full five points behind the average trade estimate from Reuters (though that estimate range was pretty wide at 50-67% g/ ex). Key production states Kansas and Oklahoma were main reasons for the low first number, with KS at 42% g/ex (vs 55% both LY and on average) and OK at just 38% g/ex (vs 47% last year and a 55% five-year average ratings).